The New York Times bestselling author of The Rational Optimist and Genome returns with a fascinating, brilliant argument for evolution that definitively dispels a dangerous, widespread myth: that we can command and control our world. The Evolution of Everything is about bottom-up order and its enemy, the top-down twitch the endless fascination human beings have for design rather than evolution, for direction rather than emergence. Drawing on anecdotes from science, economics, history, politics and philosophy, Matt Ridleywide-ranging, highly opinionated opus demolishes conventional assumptions that major scientific and social imperatives are dictated by those on high, whether in government, business, academia, or morality. On the contrary, our most important achievements develop from the bottom up. Patterns emerge, trends evolve. Just as skeins of geese form Vs in the sky without meaning to, and termites build mud cathedrals without architects, so brains take shape without brain-makers, learning can happen without teaching and morality changes without a plan. Although we neglect, defy and ignore them, bottom-up trends shape the world. The growth of technology, the sanitation-driven health revolution, the quadrupling of farm yields so that more land can be released for nature these were largely emergent phenomena, as were the Internet, the mobile phone revolution, and the rise of Asia. 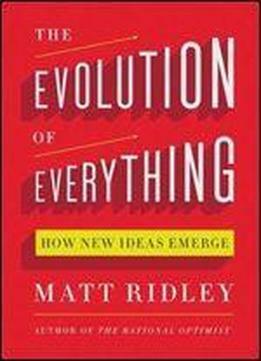 Ridley demolishes the arguments for design and effectively makes the case for evolution in the universe, morality, genes, the economy, culture, technology, the mind, personality, population, education, history, government, God, money, and the future. As compelling as it is controversial, authoritative as it is ambitious, Ridleystunning perspective will revolutionize the way we think about our world and how it works."